Extreme heat, heavy downpours, and flooding will affect infrastructure, health, agriculture, forestry, transportation, air and water quality, and more. Climate change will also exacerbate a range of risks to the Great Lakes. Explore how climate change is affecting the Midwest. In the next few decades, longer growing seasons and rising carbon dioxide levels will increase yields of some crops, though those benefits will be progressively offset by extreme weather events. Though adaptation options can reduce some of the detrimental effects, in the long term, the combined stresses associated with climate change are expected to decrease agricultural productivity. The composition of the region’s forests is expected to change as rising temperatures drive habitats for many tree species northward. The role of the region’s forests as a net absorber of carbon is at risk from disruptions to forest ecosystems, in part due to climate change. Increased heat wave intensity and frequency, increased humidity, degraded air quality, and reduced water quality will increase public health risks. The Midwest has a highly energy-intensive economy with per capita emissions of greenhouse gases more than 20% higher than the national average. The region also has a large and increasingly utilized potential to reduce emissions that cause climate change. Extreme rainfall events and flooding have increased during the last century, and these trends are expected to continue, causing erosion, declining water quality, and negative impacts on transportation, agriculture, human health, and infrastructure. Climate change will exacerbate a range of risks to the Great Lakes, including changes in the range and distribution of certain fish species, increased invasive species and harmful blooms of algae, and declining beach health. Ice cover declines will lengthen the commercial navigation season. The Midwest’s agricultural lands, forests, Great Lakes, industrial activities, and cities are all vulnerable to climate variability and climate change. Climate change will tend to amplify existing risks climate poses to people, ecosystems, and infrastructure. Direct effects will include increased heat stress, flooding, drought, and late spring freezes. Climate change also alters pests and disease prevalence, competition from non-native or opportunistic native species, ecosystem disturbances, land-use change, landscape fragmentation, atmospheric and watershed pollutants, and economic shocks such as crop failures, reduced yields, or toxic blooms of algae due to extreme weather events. These added stresses, together with the direct effects of climate change, are projected to alter ecosystem and socioeconomic patterns and processes in ways that most people in the region would consider detrimental. Temperatures above 95°F are associated with negative human health impacts and suppressed agricultural yields. The frequency of these days is projected to increase by mid-century. Cooling degree days (a measure of energy demand for air conditioning) are also projected to increase, leading to potential increases in the seasonality and annual total electricity demand. The frequency of days with very heavy precipitation (the wettest 2% of days) is also projected to increase, raising the risk of floods and nutrient pollution. 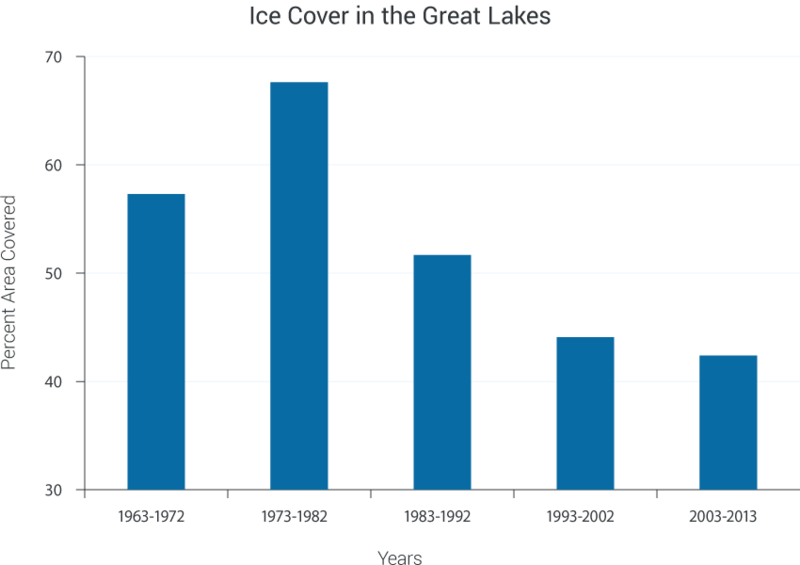 Great Lakes ice coverage has declined substantially, as shown by these decade averages of annual maximum ice coverage since reliable measurements began, although there is substantial variability from year to year. Less ice, coupled with more frequent and intense storms,1 leaves shores vulnerable to erosion and flooding and could harm property and fish habitat.2,3,4 Reduced ice cover also has the potential to lengthen the shipping season.5 The navigation season increased by an average of eight days between 1994 and 2011. Increased shipping days benefit commerce but could also increase shoreline scouring and bring in more invasive species.5,6,7(Figure source: Data updated from Bai and Wang 20128). 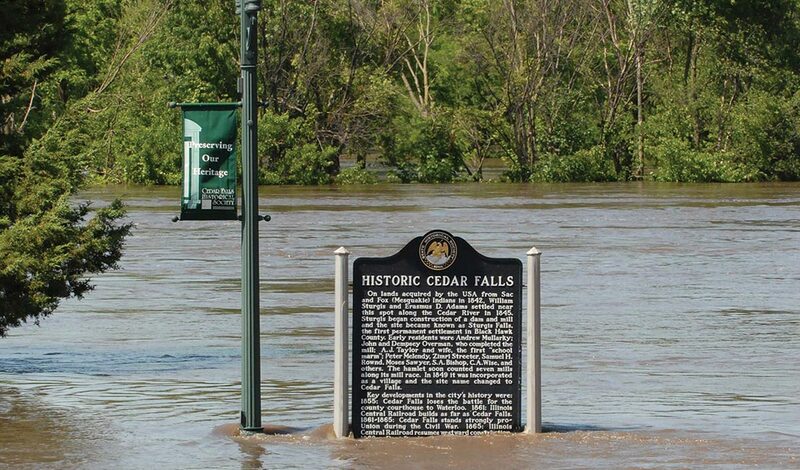 Cedar Rapids has also taken significant steps to reduce future flood damage, with buyouts of more than 1,000 properties, and numerous buildings adapted with flood protection measures. Much of the region’s fisheries, recreation, tourism, and commerce depend on the Great Lakes and expansive northern forests, which already face pollution and invasive species pressures – pressures exacerbated by climate change. Any increased productivity of some crops due to higher temperatures, longer growing seasons, and elevated carbon dioxide concentrations could be offset by water limitations and other stressors.14,15,16,17 Heat waves during pollination of field crops such as corn and soybean also reduce yields.18 Wetter springs may reduce crop yields and profits,19 especially if growers are forced to switch to late-planted, shorter-season varieties.